Both proponents and opponents of globalization assume it is a process that sweeps across national borders. Indeed, over the last twenty years, the key features of globalization provide prima facie evidence for this conventional wisdom. Dramatic developments in information and communications technology, the rise of global companies and production networks, the unstoppable internationalization of financial markets, and the deregulation and privatization of service sectors are all important examples of how this process unfolds in its raw form. Nevertheless, the increase in regional economic activity is another striking feature of this process. As multinational corporations extend their global reach, regional networks also emerge in the global trading system. Globalization therefore does not only mean a global convolution of economies, but could also lead to a spatial concentration of economic activity. All through the 1990s and at the beginning of the new century, East Asia experienced numerous structural changes leading to interesting market developments. South Korea’s rise to developed country status, the integration of the Southeast Asian economies, and the rise of China have made this region the manufacturing center of the global economy. Considering the economic importance of Japan and the other East Asian nations in the world, the crucial questions that arise include: What are the linkages between the global strategies of multinational corporations and their regional business operations? Why do subregional strategies emerge, especially recently to take advantage of China as a production base and market? Are the modern business practices in a multinational corporation’s home country easily transferred to their overseas operations and are they readily absorbed by local employees? Finally, which strategic directions are Japanese, American, East Asian and European enterprises going in this important business area of the world? 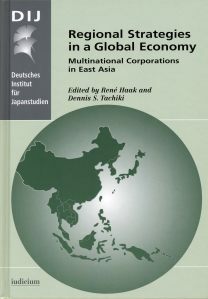 To answer these questions, this book takes a closer look at several structural features of the East Asian economy and the corporate and business strategies of multinational corporations. The volume assembles up-to-date research by a number of European, Australian and Japanese scholars, and presents analysis of various business aspects of regional strategies in a global economy. The Globalisation of Information Systems in Japanese Companies - Convergence or Divergence?